1) In the area to the left, all databases and other objects are displayed in an expandable tree view. 2) The content of the area to the right will change dynamically depending on what object is selected in the left area. A MySQL user is defined by the username and the host ('computer') from where this user may connect. The username can be up to 16 characters long. The host specifier can be an ip-address or any kind of hostname and alias that can be resolved by looking up the hostname on a server on either the local network or the Internet. Note that the two users 'me'@'onehost' and 'me'@'anotherhost' are two completely different users in MySQL. Wildcards can be used. For instance the wildcard '%' means 'any host'. So if user is defined as 'me'@'%' there are no restrictions from where this user is allowed to connect. After defining the username and specifying the host you can (and it is recommended) specify a password for the user. The password must be retyped correctly. 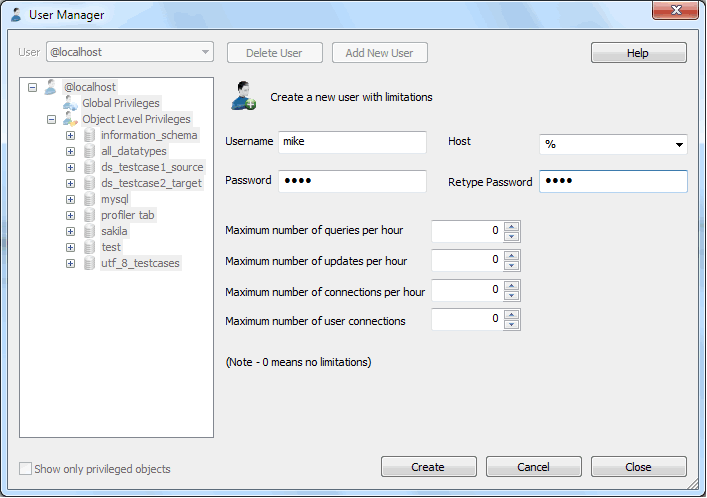 Additionally the MySQL server has an option to specify per-user limitations as you see in the dialog. To add a new user, open User Manager and click on Add New User button. Provide the username, hostname and password and select the limitations that you want to give to the user. Finally click 'Create' and the user will be created. To edit the username, password and the limitations of any user, select the user from the User drop down, select the root node from the left pane, edit and save changes. To delete a user select an existing user in the drop-down in upper leftmost corner of the user management dialog. Next click Delete user. You will be prompted once for confirmation and the user will next be deleted.